Scrub Daddy is a smiley-faced cleaning pad that is hard and abrasive in cold water and soft and supple in hot, and is one of the fastest-growing brands on the planet. 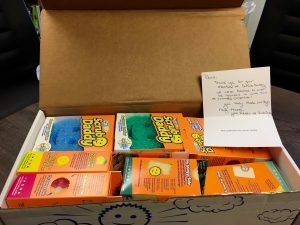 Fans of the show “Shark Tank” know that Scrub Daddy is the most successful product ever invested in by a Shark, in this case Lori Greiner. Since the show featuring Scrub Daddy aired in 2012, sales of the product have reached more than $150 million. A couple of weeks ago, I mentioned Scrub Daddy in a column. They sent a package of products to say thank you. I called to say you’re welcome, and asked if their founder would like to talk about his brand. The following is an interview with Scrub Daddy’s inventor, the irrepressible Aaron Krause. How are you? I feel like I’m on a rocket ship going a million miles an hour, with pieces falling off. Now it has a complete smiley face cut into it that fits the name and turns it into a kind of character. How did that innovation come about? I had tried to market it as a hand-cleaning sponge—but it’s an expensive polymer, not a $1 sponge. I actually tried to include it in the sale of another business to 3M, but they weren’t interested in it. So, we carved that and some other products out of the deal. I sold that business in 2008, and then I put a box of these things in the back of the factory and called it junk. One day I tried using one to clean some lawn furniture and a table. One sponge did it all without scratching the paint. I threw it in the kitchen sink to clean it and decided that night to try washing the dishes with it. That was the first time that we even knew the product changed its texture in hot water. Then I did the dishes and realized the value of the eyes for gripping it, and I got excited and cut a slot for spoons into it with a knife. The next day, I got everyone together at my business and told them this was going to be a great product. Almost everyone was on board, but my business partner at the time didn’t want to go with it. We ended up splitting over this. How about you as a key brand element? You’re often referred to as the daddy of Scrub Daddy. I’m now purposely trying to separate myself from the brand and from being the only salesperson. I’m an entrepreneur, a CEO, and an inventor. I know what I’m doing and don’t want to be locked in as the only face of the brand or the product. Then the product can’t live without me and that can’t be the case. I have purposely done more and more to separate myself from the brand. We’ve created some caricatures of Scrub Daddy to start moving away from me, personally. I don’t do all the shows on QVC anymore. We just filmed our first TV commercial ever to use in 2018, and I’m not in it. Your growth has been literally exponential. What are the next steps for the brand? The idea is to become a recognized name brand of all cleaning products around the world. I just did shows in Paris, Dubai and Taiwan. We want to create a world-renowned product line under the name Scrub Daddy made up of high-end products that you know and trust. Mostly utilizing our exclusive material, but not for everything. We already have about 30 different products. Scrub Daisy is our latest. We’re working on a Scrub Daddy mop. Is there anything you would change if you had it to do over again? We all make mistakes in business. You use it as a learning opportunity. I’ve made errors that cost the company a bunch of money. We changed the whole style of the package right away when we realized it wasn’t resonating with customer. But that mistake let us see that we had to look at everything as a whole brand. Any new product has to flow into the same style. I’ve made a lot of mistakes, but nothing has been costly enough to put us out of business. I love what I do. We’re also a family business. We have more than 50 employees. Full benefits. We try to make sure people who work here love what they do and know that they are appreciated and their health is taken care of. It’s a good corporate culture. We’re at 39 percent brand awareness right now, the third-highest sponge brand, nationally. That’s in just four years, with absolutely no paid advertising. “Shark Tank” has been like an annuity. Two nights ago, they ran a show that featured us in an update. So, we are constantly getting hits from TV. And the new TV spot will be a big turning point for me and the brand.